Lotus flowers greet the day by opening up and then close at night, resting and preparing for a new day. Lotus root, grown mainly in Southern and Eastern Asia, is an aquatic plant that establishes it’s roots in the bottom of rivers, lakes, and streams, while the flower emerges and rests on the surface of the water. The lotus flower is considered an important symbol, representing divine beauty, sexual innocence, and purity. Despite it’s delicate reputation, lotus flowers are a hardy perennial plant, blooming every year, for many, many years. However, lotus flowers are not the only star of the show. The root of the lotus flower is considered a delicious and nutritious snack in Asian cuisine and a powerful herbal medicine. Lotus root’s taste a bit like coconut but have a similar texture to potatoes. They are commonly pickled and used as a topping on salads or are added as an extra flavor element in prawn dishes. Whether you use it as a natural remedy for blood circulation or simply enjoy it for its taste, lotus roots can have a lot to offer. There are many health benefits associated with lotus root due to its rich nutritional value. If you’re looking for a way to incorporate essential vitamins and minerals into your diet, lotus root is a wonderful edition. Vitamin C: Lotus root has been found to be a rich source of vitamin C, providing 73% of the daily recommended value. Vitamin C is a vital element of a healthy diet because it helps support overall health and many functions of the body. Getting enough vitamin C boosts your body’s immune system by protecting it against viral infections and protecting your body against free radicals. Vitamin C is essential to heart health, decreasing LDL cholesterol and triglycerides. Vitamin C encourages the regeneration and repair of tissues, helping your body to heal wounds and to a smooth and healthy-looking complexion. Vitamin C plays a large role in the development of collagen, a structural protein in body that helps build and maintain skin, bones, blood vessels, and organs. B-vitamins: Lotus root contains essential b-vitamins, such as riboflavin, niacin, pyridoxine, folate, thiamine, and pantothenic acid. Each B-vitamin plays an important role in your health. Riboflavin is an important element to your diet as it generates energy and healthy red blood cells. Niacin is necessary to help reduce cholesterol. Pyridoxine is important to the functioning of the nervous, digestive, and cardiovascular systems. Some studies indicate that folate is important to fetal development and maintaining heart health. Thiamine is important to eye, digestive, heart, and nerve health. And pantothenic acid boosts hemoglobin levels, boosts the immune system, and helps to maintain the health of skin and hair. Minerals: Lotus root is a good source of minerals, boasting significant copper content. Copper enables the metabolism of iron and helps keep blood vessels strong, supple, and healthy. Iron, another mineral found in lotus root, helps with the metabolism of copper and is a necessary part of red blood cell production. Zinc, another mineral found in lotus root helps balance hormones and maintain muscle health. Magnesium, another nutritional benefit to eating lotus root helps to reduce anxiety, prevent migraine headaches, and boost energy. 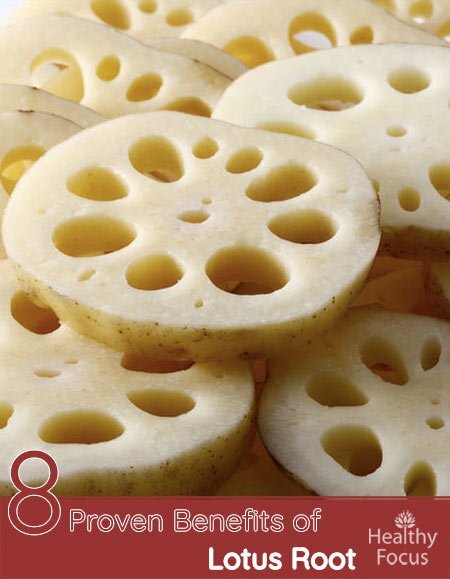 Lotus root contains some calcium, essential to maintaining strong bones and healthy teeth. And finally, the manganese content of lotus root is important to bone health and reduces inflammation. Not only is lotus root a great source of vitamins and minerals, but this low-calorie food is also a good source of protein, fiber, and phyto-nutrients. The sodium and potassium content found in lotus root work in conjunction to maintain fluid balance. 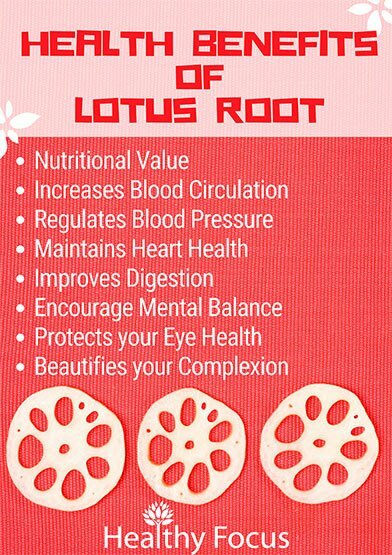 Due to its rich nutritional content, lotus root’s potential to benefit your health is promising. From improving blood flow to maintaining your weight, lotus root can benefit your and your health in a number of ways. Lotus root helps to improve the circulation of blood flow, ensuring that all the organs in the body are properly oxygenated. When your organs receive adequate oxygen, they run a lot smoother and do a better job of keeping your body up and running, while giving you an energy boost. Rich in copper and iron, lotus root also encourages the production of red blood cells, preventing symptoms of anemia from popping up. Lotus root contains sodium and potassium. When these two elements work together, they help to maintain healthy blood pressure levels. Potassium and sodium have a sort of yin and yang effect: potassium strikes a fluid balance in the body, which helps to minimize the affect of sodium has on blood pressure. Sodium affects the blood pressure by constricting blood vessels, blocking the flow of blood and therefore increasing pressure. Potassium helps to relax the blood vessels, ensuring that blood flows to and from the heart at a healthy rate. Given that lotus root helps to increase blood circulation and regulates blood pressure, it should come as no surprise that eating lotus root may help improve your cardiovascular health. The fiber content of lotus root also helps to reduce LDL cholesterol levels, which can clog arteries and lead to such problems as heart attack, stroke, and heart disease. Lotus root is loaded with dietary fiber, which helps to keep things regular and moving smoothly. Getting enough fiber helps to add bulk to stool and encourages bowel movements, helping to prevent constipation. Adding bulk to stools also helps prevent the development of diarrhea. The rich fiber content also encourages the release of gastric juices, helping to break the food down and absorb nutrients. Lotus root contains the B-vitamin pyridoxine. Pyridoxine is known to increase your sense of well-being and inspire mental stability. Pyridoxine works directly with the neural receptors that dictate your mental state and mood. These receptors also influence stress levels and headaches. Adding a bit of lotus root to your diet might not be a bad idea if the stressors of modern life are getting you down. Lotus root contains a significant amount of vitamin A, which is important to maintain your vision while preventing macular degeneration. Lotus root is rich in vitamin C, which encourages the development of collagen, essential to maintaining the skin’s structure and preventing the development of age spots, sunspots, and fine lines. Collagen keeps your skin looking supple and smooth, while preventing sagging and dullness. It should be noted that the listed benefits of lotus root have yet to be subjected to rigorous scientific research. Clinical studies are needed to confirm these results, however, the preliminary findings are promising. Lotus root should never be used in place of traditional medical treatments when treating any ailment or condition. Speak to a physician before incorporating lotus root into a treatment routine. Before eating raw lotus root, be sure to wash carefully and thoroughly as this aquatic vegetable may contain parasites that can be detrimental to your health. Parasites are commonly found in aquatic plants and when ingested, can cause such symptoms as fever, stomach pain, vomiting, diarrhea, and intestinal obstruction.